Tuna Bite Better and Better the last few seasons! Starting in June the Yellowfin Tuna Bite has been great the last couple years. 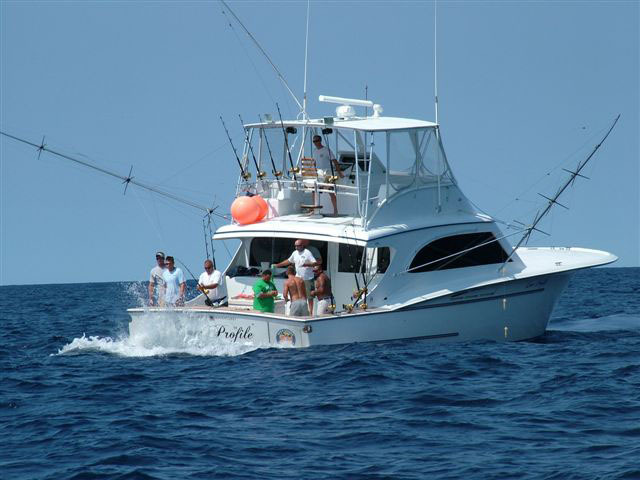 LOW PROFILE is a Serious Offshore Fishing Machine. Twin 800 Horse Power Cat Engines, 55 feet in length, and custom built in North Carolina. This boat is a awesome sea boat, and raises fish with the best of them. The inside is fully appointed with all the luxuries you'd expect to find on any live-aboard yacht. Air Conditioning through-out, Full Galley, Satellite Radio, TV, DVD, 2 Staterooms, Large Private Head with Full Sized Shower. This NJ Charter Boat spends her winters in the Bahamas doing extended long-range live-aboard cruises, so you can be sure she is the boat you are seeking for you corporate group.